UBM is a global business-to-business event organiser headquartered in London, with a team of almost 4,000 employees located in over 20 countries. The company delivers more than 300 market-leading B2B events each year in a competitive market space, where an engaged and active sales team is key to their success. 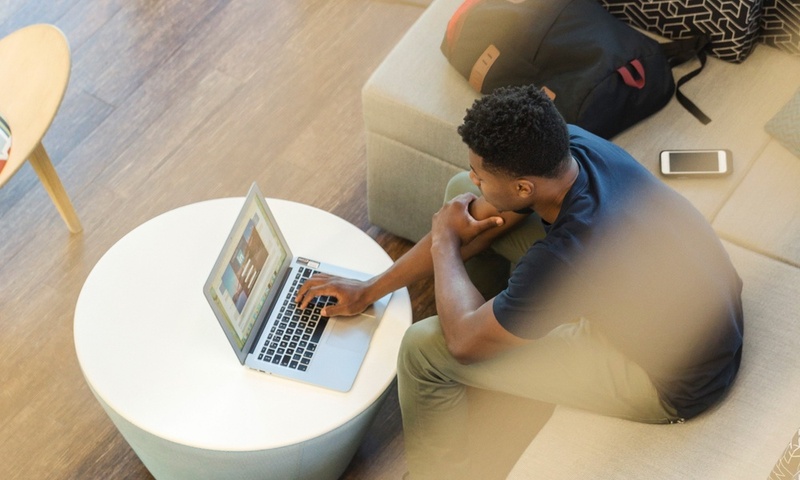 When UBM selected Salesforce as their CRM solution they adopted a two-stage process to get teams fully engaged with the new sales process, and ensure reps were driving the correct sales activities. In the first instance, UBM was keen to understand how Salesforce was being used by the sales team. They wanted to track sales behaviours and get insight that would indicate whether or not reps were following best practices. Secondly, having learnt how the system was being used, UBM wanted to focus on motivating more of the key positive sales behaviours with their teams. Working with CloudApps they implemented a fun and engaging environment where reps could learn, engage and excel in their roles, while appreciating the benefits of appropriate use of Salesforce. Using SuMo Insight, UBM was able to build a solid ‘Sales Performance’ baseline to silently track and learn from users’ behaviours within Salesforce. Over a 3-month period they collected detailed insight into how well the team was using the system but also crucially, identified which sales behaviours led to the best outcomes. This sales performance insight allowed the UBM Sales Operations team to uncover personalised coaching opportunities across the team, providing invaluable input for the sales managers. UBM then switched on SuMo Motivate, to engage reps in competitions that were tuned to reflect the learning gained during the Insight phase. Visible to users, the tool rewarded reps for exhibiting high-value sales activity within Salesforce, focusing specifically on the behaviours the company now knew would drive to a successful sales outcome. The company injected some fun and competition into the process by linking sales behaviour with the recognised recommendation to consume 5 portions of fruit and vegetable daily for a healthy lifestyle. UBM wanted to indicate to the reps that by delivering the same number of high-value sales behaviours a day they would create a wholesome and healthy pipeline and boost their sales activity. To carry through the theme, the office was decorated with colourful fruit and vegetables. The company also set up SuMo Inspire TV, on shared display boards, so teams could track their performance in real time. By sharing a virtual league table, the reps could see how they performed and identify how their sales activity was influenced by behaviours. All the selected high-value behaviours were equated to a different fruit, each with a different cadence that related back to its difficulty. The goal was for each rep to score at least 5 pieces of fruit, from a possible 14, each day. Attending a face-to-face sales meeting secured a banana. After just a few weeks of active competition, UBM started to gather impressive results and as the graph indicates were able to show the correlation between following the right sales behaviours and meeting revenue targets. 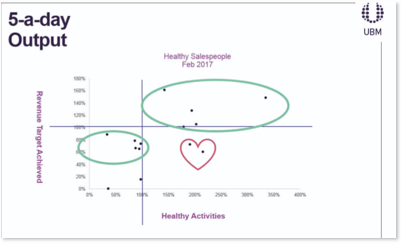 The large group of sales reps represented in the top right quadrant all displayed over 100% of the expected 5-a-day sales behaviours and exceeded their revenue target. A small number of reps over-achieved on their 5-a-day sales behaviour target but fell just short of their revenue target. Represented in the heart shape in the bottom right quadrant, UBM realised this handful of reps required extra coaching. The reps shown in the bottom left quadrant did not achieve on their 5-a-day target and it was no surprise that they also did not achieve on their revenue target. No reps achieved their revenue target by not following the right sales behaviours. Working with SuMo, UBM was able to collect insight to support their reps to use Salesforce successfully and motivate and support them to drive the right sales behaviour, maximising their sales activity to meet revenue targets. By setting the teams up on a cadence of 5-a-day sales behaviours, the company put in place good practice to build a healthy pipeline and harvest strong sales results for the future. 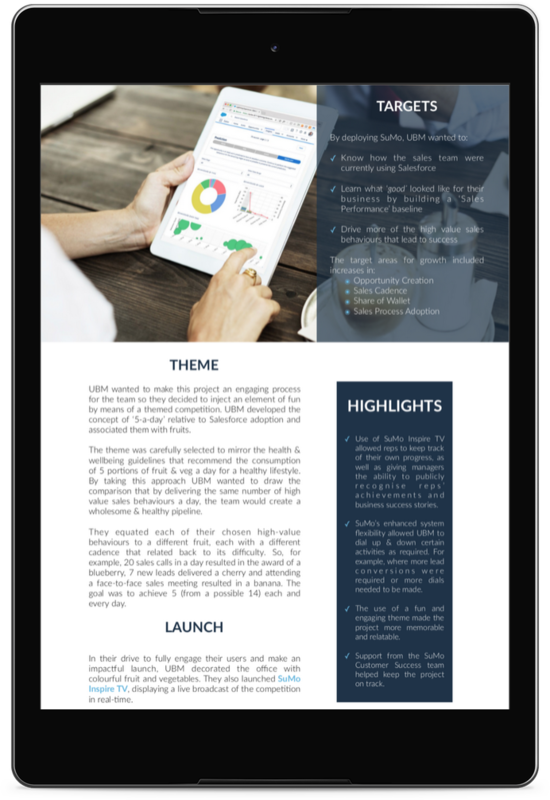 You can read the full UBM case study here.